Nicole J. Butler: "Living Truthfully": I'm SHOOK! I have a commercial callback tomorrow (yayy) for Wake Forest Hospital (or something like that...the name is really long). Okay, here's the non-business stuff. I went to a screening of Blood Diamond tonight. WONDERFUL movie. It walks a fine line between being informative and being entertaining (and I mean that in the most NON-haha-funny-way possible), and took me along for a heart-wrenching ride. Go see it. On the big screen. Alright, this next part might get a little ghetto, so forgive me in advance. 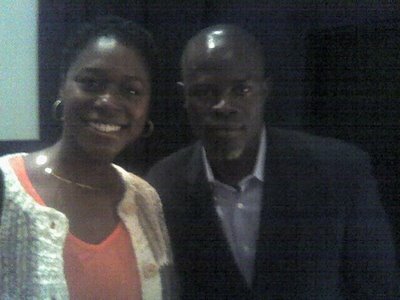 I love me some Djimon Hounsou, alright? Whenever I see his work, I am just riveted to the screen. Because of his gravity, because of the honesty and integrity in his work, the quiet dignity he brings to each character, and because the brotha is FINE, okay? So. He and producer Marshall Herskovitz came into the screening room for a Q & A afterwards. The moderator spoke first, then the producer. While they were talking I was staring at Mr. Hounsou while trying not to look like I was staring. I just wanted the other two dudes to be quiet so I would have a REASON to look at dude, right? So finally he joins in the conversation. Well-spoken, inspirational, just...UMPH! I don't get "shook" very often. Celebrity status doesn't move me. I am not one to run around with a camera taking pictures with every 'star' I meet. That being said, I had to go meet this guy & let him know what I thought of his work. I formulated a coherent sentence in my mind and practiced it under my breath a few times before I got up to him. I delivered it without making myself look like an idiot (I think). Then I turned to go. I got to the back of the room and decided I wanted a picture. I went back up to the front and had someone take a picture of us. I practically left the theater skipping, and I grinned all the way home. I so would love to work with that man. Okay, I managed to keep that my story clean, lol. Now I gotta get to bed. Pilates early in the AM! P. S.--Wish me luck with the audition tomorrow. It would be great to book ONE MORE before the end of the year! I love him too. Isn't he an amazing actor? I just saw "Blood Diamond" last night at the DGA. Leonardo was phenomenal, as well. A few weeks ago, I went to a tribute to Ed Zwick, at the AFI Film Festival. Ed showed some clips of the film and shared about making the movie. It was amazing! He talked about how emotional it was to be near where those events took place and to get to know the African people. It's great you got to meet Djimon. Have a wonderful Christmas and a Happy New Year!!! Thank you, Joan. Merry Christmas and Happy New Year to you, too!